I have had a packet of black quinoa in my pantry for over a year! My first attempt at cooking with quinoa was a dismal failure, thus I have been avoiding “that” packet and thus it has just been taking up space. Until today! There was 2 1/2 cups of dried quinoa left and I threw it all in my rice cooker with 3 cups of water and let it cook whilst I search the net for an easy recipe that looked yum. 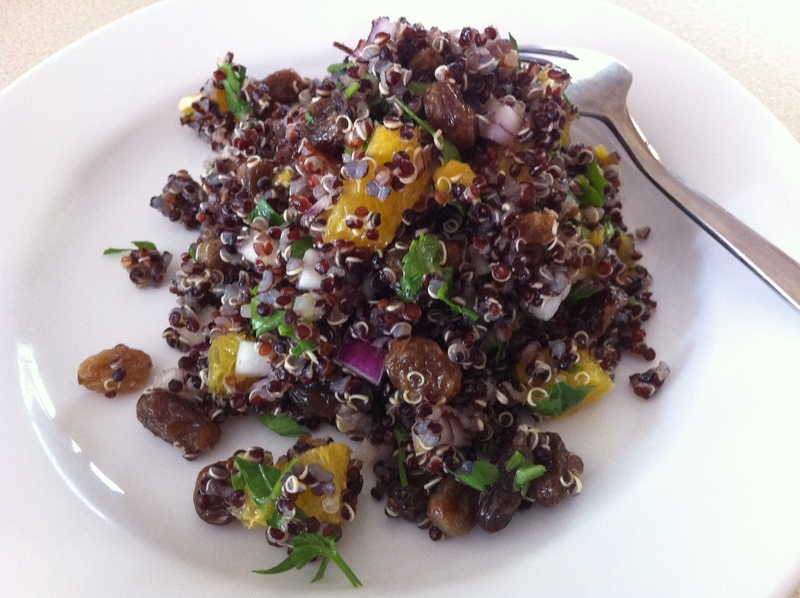 This is the recipe I came across….. “Black Quinoa Salad with Orange and Cumin Dressing” and here is my variation that suited what I had in my fridge. I am sure you could use with any quinoa you have handy too…..
Whisk together and pour over salad. Toss gently and serve.